Updated Sunday November 27, 2016 by Kitchener Sports Association. Each year, all local minor sports groups, including KSA, have the opportunity to have one of their key volunteers recognized. This is a list of KSA's volunteers. We thank them, and the hundreds (and hundreds) of others, who have helped local minor sports groups and athletes. 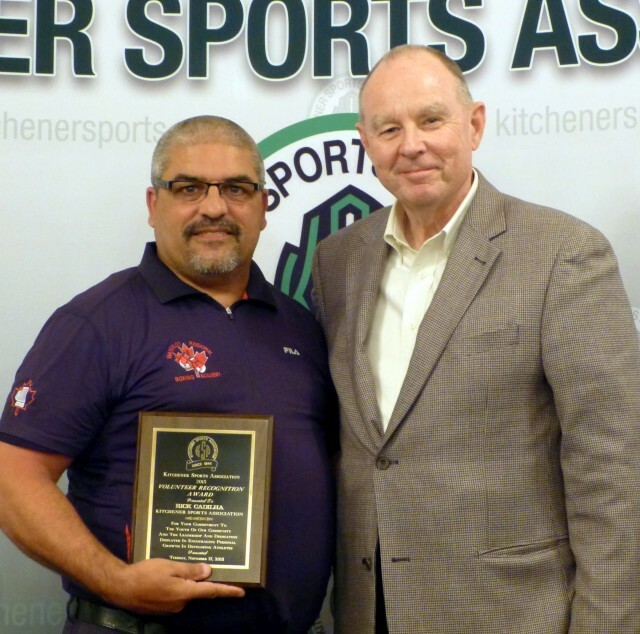 PHOTO: KSA 's Volunteer of the Year, Rick Cadilha with KSA President Bill Pegg at KSA's 27th Annual Volunteer of the Year Dinner held November 17, 2015. On occasion, as noted below, KSA also recognizes others with special award presentions.